I served in the US Peace Corps in Niger, West Africa and I absolutely loved it! Nigeriens are warm, hospitable, beautiful people. There is lots of information about them available through Joel Mayer's Focus on Niger page, although unfortunately Joel has said he can no longer maintain/update it. Friends of Niger is also a useful resource. In the meanwhile, you could amuse yourself by checking out The Fufu Lovers Guide to African Restaurants and submitting a review of your favorite! lekkiim afoos yennoottef d amawal. Only stirring a hand to pull the turban over their eyes. *"the one who has an eye that isn't living," referring to the soundhole of the Tuareg single stringed violin, enzad, traditionally played by women in the evening." This poem is from the poems collected in the Hoggar region by Père de Foucauld, published in 1925 in France. As far as I've been able to ascertain, there is currently no copyright on these poems. Please use the Guest Book or the envelope symbol on the Geoguide (top of page) to email me any Tamajeq poems you may know of or have composed, and I'd be very happy to post them here! Of course you can also use the Guest Book to give me any comments or corrections on the page. My friend Khadijatou Haroum (in the photo above) died in 1996 while waiting for medical assistance in her (at least) 6th delivery. She left one living child and her husband. The photo of me on the home page was taken in her dry season tent. Ghaishatou Mohamed also died of maternal mortality, a few months earlier. She was a dear friend and the mother of Rakia, seen in my photo gallery. 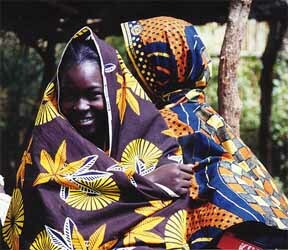 Fatima Yusuf was my Nigerien mother, and died in 1995 of tuberculosis. These three women, despite a lack of formal education, were learned in Tuareg culture and did their best to pass that knowledge on to the children in their households. I think they would be pleased to know that I am trying to share with the world the beauty of that culture. Below are Abdullahi Abardak (my Nigerien brother) and his niece Rakia Ghoumar, whose first name I shared when I was in Niger. They are sitting in Abdullahi's 3-room adobe house. The Majiya Valley of Niger, from Kolen Kura (Hyena's Pass) trail. The valley is crisscrossed with windbreaks planted and maintained with help from CARE International. Its (relatively) fertile bottomlands support one of Niger's most densely populated rural areas. Millet, sorghum, and beans are the staples grown here, and cabbage, onions, tomatoes, hot peppers, tobacco, and cotton are grown as cash crops. The rocky slopes and plateaus provide rainy season fodder for livestock, as well as space for additional agricultural activity. This is one of my friend Assalama Ousmane's cousins, come to bring condolences on the death of a relative. Here are the men of Ayawan, building a cement well with the help of master mason Zabairou Ibrahim (left foreground in orange shirt). Five years later, I visited and found that at the height of the dry season, this was one of two wells in a 5 km radius that had plentiful water. This may not sound impressive to old Niger hands unless you consider that this radius encompasses at least 12 villages and more than 2000 people and their livestock. Below we see the alternative to such cement wells: dig a hole in the shifting sands of a riverbed until you hit water. The well here is only a meter or two deep; it seems convenient, doesn't it? The disadvantages are that when it rains (once every 2 weeks in a good rainy season) a) you can't get any water for a day or two, b) the well falls in and you have to dig a new one, and c) all the human and animal wastes of the region get washed into this water. Note that the girl here is carrying water in the traditional spherical water jars which she will place in paired baskets on a donkey's back. I'm going to be leaving for Niger with the Peace Corps on July 8th. I was wondering if you might be able to give me some tips on what to pack and some insight on what I might expect when I first get there.